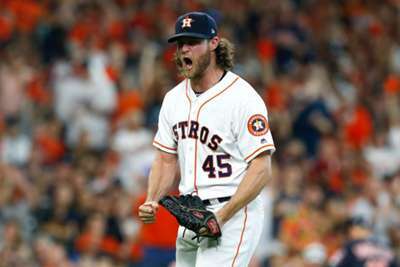 The Houston Astros are one win away from getting back to the American League Championship Series (ALCS) after they took down the Cleveland Indians 3-1 in game two on Saturday. Gerrit Cole tossed a gem, delivering seven innings of three-hit, one-run ball with 12 strikeouts and no walks. He is just the second pitcher in MLB history – after Tom Seaver – to record 12 strikeouts without walking a batter in a playoff game. Marwin Gonzalez delivered the big hit with a two-run double in the sixth inning off of Andrew Miller and Alex Bregman added insurance with a solo shot off Trevor Bauer in the eighth. Game three is scheduled for Monday in Cleveland. Coming into the American League Division Series (ALDS), two things were very clear, the Astros strike out a lot of batters and the Indians do not strike out very much. No-one struck out less than Cleveland in MLB this season (1,189 Ks) and no-one struck out more batters than Houston's rotation (1,687 Ks). Something had to give in this series. So far what has failed is Cleveland's ability to avoid the K. For a team that struck out a little more than seven times a game during the season (7.33), the Indians have been rung up 22 times through the first two games of the ALDS. Against Cole, they struck out swinging 12 times. Houston were the best team in MLB at missing bats in the strike zone this year, so that makes sense, but one would have thought the Indians would have been a little bit better than they were through the first two games. Here is a statement you will not hear a lot in MLB postseason play: the Astros will probably be happy to get out of Houston and head to Cleveland. Yes, Houston played well in the first two games of the series, but the Astros have been a much better team on the road than at home this season. Houston won 11 more games on the road this year than they did at home (57 to 46), but it is more than about just wins. The Astros were a better hitting team on the road as they scored 51 more runs away from home and they gave up 44 less, as well. Houston's ERA was 2.87 on the road as opposed to 3.34 at home. Houston know exactly what they are getting into as they have gone on the road in the postseason and won in recent years. Houston won a game at Fenway Park to seal the ALDS last season, another to tie the World Series at one game apiece at Dodger Stadium and then one to clinch it in Chavez Ravine. The Astros are not just a good road team, they are a tested one. There is no denying it, Carlos Carrasco is a fantastic pitcher. The way he mixes his fastball with an assortment of curves, sliders and split-finger fastballs is fantastic. He is one of the most unhittable pitchers in baseball. However, he should never pitch against the Astros the third time through the lineup. Carrasco is one of the best in MLB the third time through a batting order, holding opponents to a .190 batting average this season in that situation. But in Carrasco's loss to Houston on May 20, he tossed six shut-out innings and then allowed a two-run homer to Brian McCann and was handed a loss. In his May 26 win over Houston he allowed a run-scoring double to Jose Altuve and a two-run homer to Tony Kemp, and then in game two on Saturday he allowed two runners to reach base in the bottom of the sixth. Both would come around to score later. This does not change the fact that Carrasco has been great overall against Houston in his career, as he has gone 4-2 with a 3.45 ERA with 55 strikeouts, but he probably should not be allowed to face off with the Astros a third time through the lineup.